Not discreet. Main squeeze. Photo by Ted Friedman. Only last year, construction on U.C. 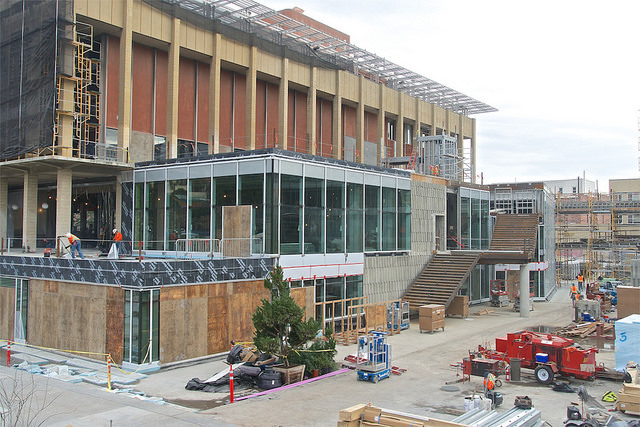 Berkeley’s replacement for Eshelman Hall reached its mid-point. 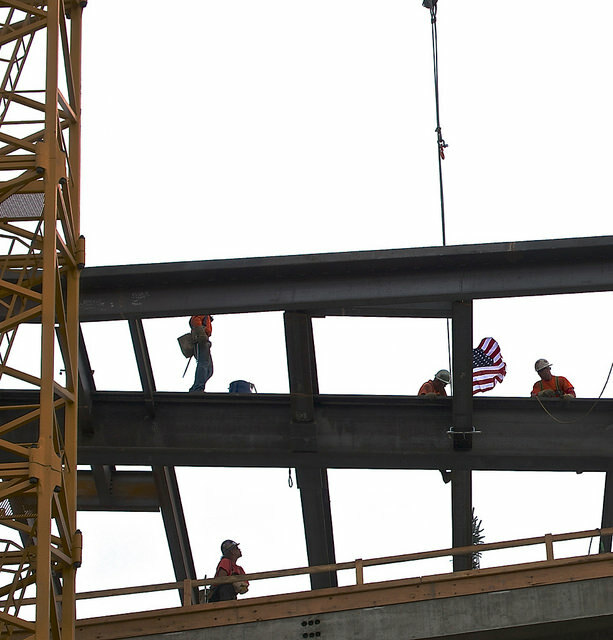 Workers raising mid-point Eshelman beam. Photo by Ted Friedman. The old Eshelman was picked apart bite by bite a year before. 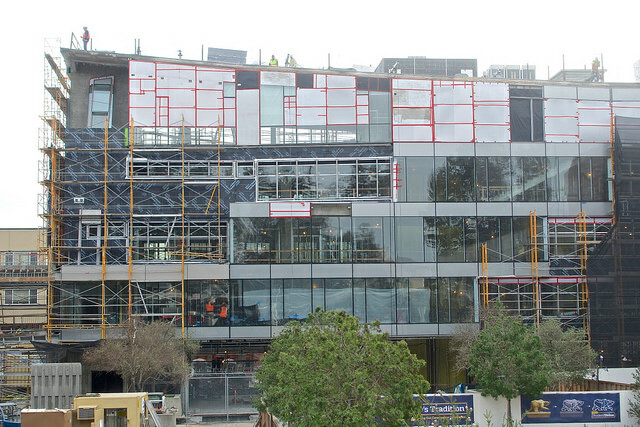 Now the Daily Californian reports that both Eshelman and the next-door enhanced student union building are nearing completion. View through eyes of store dummy. Photo by Ted Friedman. Someone is bound to ask if the new structures are good design. Eshelman is clearly too close to the street. The old Eshelman was well back of the curbside location of the new Eshelman. 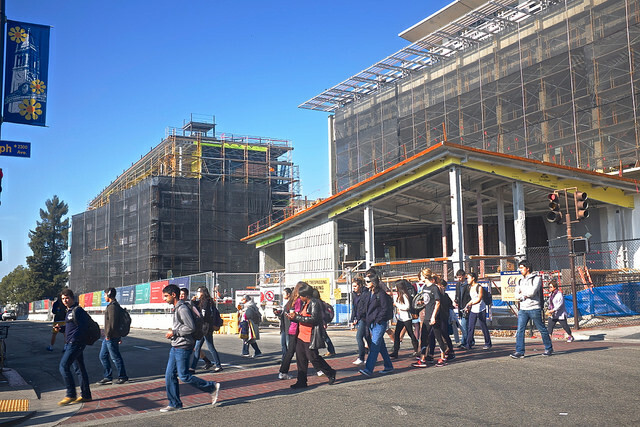 Additions to the new Student Union Building pushed Eshelman into the street and that needs to be considered when asking whether the add-ons to the new Student Union Bldg. are worth that. New Student Union add-on. Photo by Ted Friedman. Any chance to have opposed the lower Sproul Plaza Development has passed. Opposition would have been folly. An effective U.C. 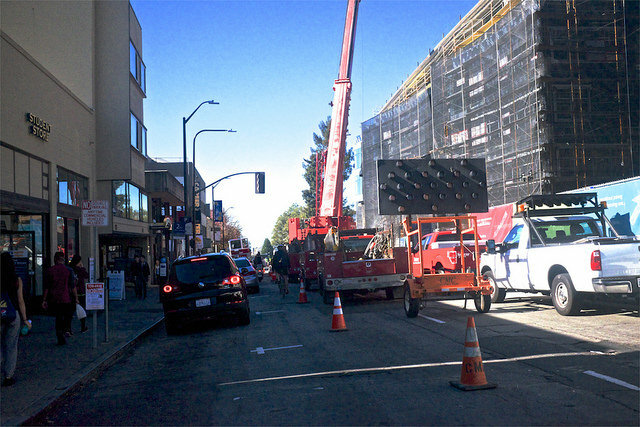 Berkeley public relations campaign on behalf of the project–left little room for challenge. The project was too big, too dazzling to fail. The Old Berkeley Student Union, which the new and improved structure replaces had lost its youth. 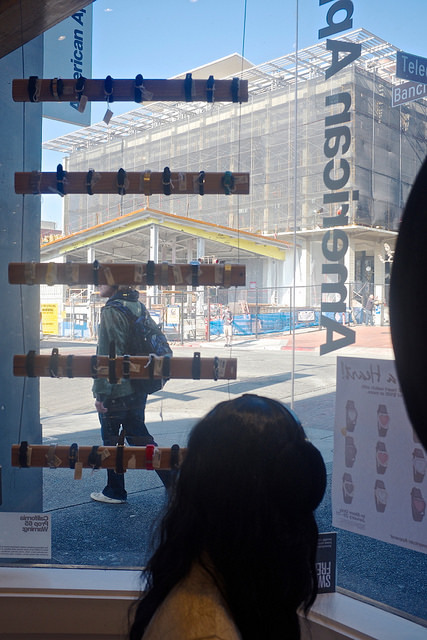 From the 90s, the Student Union Building had become increasingly inaccessible to denizens of Berkeley’s Telegraph Avenue, who had formerly used the student Union for street Chess and as tramp and hobo central. Parts of the Student Union had been on lock-down for twenty years. A public restroom was available. It remains to be tested whether the new student union will share its facility with the Berkeley street it will overwhelm. Eshelman Hall had to go. It was deemed unsafe. Its eye-popping views of the Campanile and the hills seem to be recaptured in the new Eshelman. Rear Window(s) of new Eshelman Hall will retain its famous views. Photo by Ted Friedman. This entry was posted on Thursday, January 29th, 2015 at 8:12 am	and is filed under The Berkeley Scene. You can follow any responses to this entry through the RSS 2.0 feed. Responses are currently closed, but you can trackback from your own site.